A week from today, the quickest handover in memory of a Stateside see will conclude in Detroit as Archbishop-elect Allen Vigneron takes the reins of the 1.5 million-member Motor City church just 23 days after he was formally tapped to lead it. • Is greatly concerned about the economy of southeastern Michigan, especially the impact on people and families and the ability of the church to conduct social ministries and charity. • Hopes to reinvigorate the priesthood by helping more men discern their call to the vocation and continuing to use the laity in ministerial roles. • Intends to concern himself with higher education, especially looking beyond the intellectual training of students at Catholic colleges and universities to their "pastoral care" and religious training. • Will immediately immerse himself in the details of the continuing reorganization of parishes in the archdiocese, a process called Together in Faith that has required the closing and consolidations of dozens of parishes. But issues central to the Catholic faith concerning abortion and stem cell research are plainly high on his agenda, as he prepares to leave the Diocese of Oakland, Calif., to replace Cardinal Adam Maida as archbishop of Detroit and the leader of 1.4 million Catholics in southeastern Michigan. 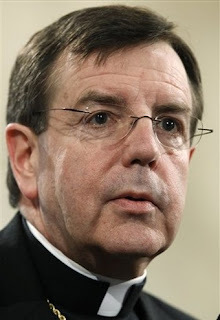 "I share the concern of all of the bishops of the United States that the administration has, at least prior to the election, given us indications that they are going to rescind some of the protections of the unborn," Vigneron said. "And I am very disappointed in that. Asked if he might do what some American bishops have done -- attempt to deny the sacrament of Holy Communion to Catholic politicians who support abortion rights, Vigneron demurred. "I am not going to answer any hypothetical questions like that, especially from this distance," said Vigneron, who spoke by phone from his office in Oakland. "I simply want to affirm that part of being a Catholic is having a conviction that on these moral matters, the church speaks the mind of Christ. And I want to help Catholics, especially Catholics in responsible positions, to maintain the integrity of their professions." Throughout the interview, Vigneron sounded as he has been described by many: an energetic, scholarly man, deeply grounded in the love of his faith, who has a curious mind -- and a conservative cleric, especially on issues of church policy and practice, like nearly all bishops and archbishops appointed by Pope Benedict XVI and his predecessor, John Paul II. And when it came to the economy in Michigan, which struggled to emerge from the recession of 2001 only to find that the rest of the world had joined it in the downturn of 2008, Vigneron spoke the words of a native son, whose brother has made a living in the automobile industry. "I am concerned for the very negative impact this has on the people I will serve -- especially their families," he said. "I don't think any priest could help but feel tremendous sympathy for what this means to them. And, by simple logic, a weak economy affects a church, and her institutions have fewer resources for all of the good works we are involved in." As I come to this prayer, I – as perhaps many of you, too, do as well – make it with a certain sadness that many of those who are God’s trustees in the civil order are confused or even mistaken in their convictions about God’s plan for us and our lives together: about the usefulness of capital punishment to secure public safety, about the right to life, about marriage and family, about the place of the stranger in our midst and the need for secure legal status for those who are part of our community, about the protection and care which children deserve – especially through their quality education, about the attention to be paid to those who have fallen to the margins of our community, and, finally, about the nature of freedom and the authentic and irreducible dignity of every person. In all things and at all times, may the Spirit of God direct our new President and all our other leaders to know the right and may God give them the courage to do the right. Let us include in our prayer today a word of thanks to Almighty God, for the free nation he has given us as our home. In ages past, God enjoined his people to pray for rulers who did not know him, as they lived and worked within states that sought even to impede the living out of their religion. Together let us bless the name of God for our religious liberty and praise him that in our exercise of this liberty we have been able to do our part to make America a greater and freer people, a light of liberty to the world. And finally, in this season let us give particular thanks that God in his Providence has brought our country to a moment when a man who not long ago could not even have enjoyed the basic rights of citizenship is now assuming the highest office in our nation. God bless America. God keep us free. The rites of transition begin Sunday with a Mass celebrating Cardinal Adam Maida's silver jubilee as a bishop. Named archbishop of Detroit in 1990, the long-planned liturgy will now double as the retiring cardinal's farewell from the post.